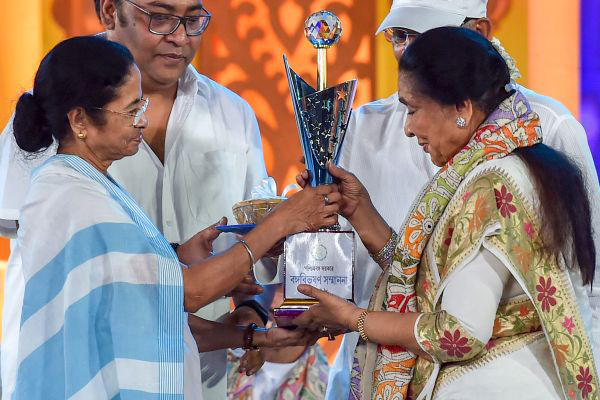 MUMBAI: Legendary singer Asha Bhosle was conferred the Banga Bibhushan, the West Bengal Government's highest award, by Chief Minister Mamata Banerjee on Monday. "I am elated that Asha Bhosle has accepted our invitation and has taken the pain to come here. We can never forget her contribution," Banerjee said at the event. Bengali matinee idol Prosenjit Chatterjee and Justice Shyamal Kumar Sen (retd) also received the Banga Bibhushan. On Banerjee's request, the veteran singer mesmerised everyone by rendering a Bengali song. This year, writer Samaresh Majumdar and footballer Subrata Bhattacharya also received the Banga Bibhushan. Other recipients of the prestigious award included Girija Shankar Rai (writer), S.K. Bhowmik (researcher), Mohammed Habib (football player). Singers Sriradha Bandopadhyay, Arundhati Homchoudhury and Partha Ghosh (elocutionist) received the Banga Bhushan award. The Mamata Banerjee-led government instituted these awards in 2011 after it came to power.